The Square was founded in 1348 in a part of the settlement of Chudobice as the main square of the lower New Town and was used as a market for hay and corn. In 1896 it was renamed Havlíčkovo. The lower tower is a part of the Church of St Henry, dating back to the second half of the 14th century, the higher tower is the belfry. The ecclesiastical buildings were, until 1787, surrounded by a cemetery, and it was at this place that Jindřišská Street ended. The street was extended to the Square between the belfry and the Church in 1827 (see picture 493). On the left we can see a former old school, later a pub. The large structure in the middle served as a police headquarters. The two-storey structure, wedged between the belfry and the police building, housed the large and well-known delivery firm of F. Kocourek. It is remarkable that such a tiny building should in those days suffice for the administration of business carried out all over the Austro-Hungarian Monarchy. On the left we can see, in contrast to the previous picture, a whole block of buildings in front of the belfry, including the two-storey edifice of the City Weighing and Market Office, the so-called Hay Scale, No. 979. Unfortunately the view of the building is partly obscured by a gas lamp-post. Otherwise we would be able to see better a wagon full of hay which is just being weighed. In the background in the middle we can see the building U Tří jezdců (The Three Horsemen), No. 869, which is one of the oldest in the Square. 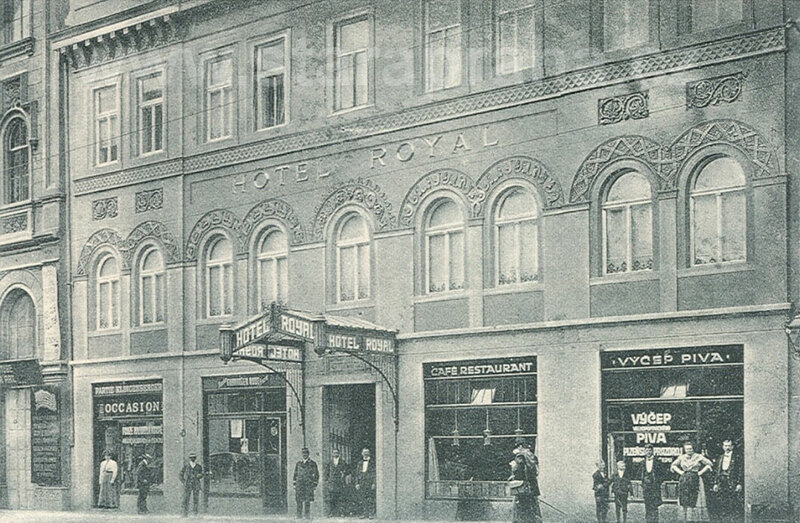 In 1907 it was replaced by hotel of the same name built by J. Zasche. On the right, behind the corner building with a tower, No. 995, the Corn Exchange is hidden(see picture 490). The buildings on the right side, with exception of two more recent ones, the first and the third ones from the left, date back to approximately 1840-1860. On the left, on the corner of Jerusalémská Street, stands the building U Linků, No. 977. The whole complex of buildings, linked by a two-storey extension with St Henry belfry, was constructed on the site of the above-cited group of buildings in the years 1911-1912 to plans by J. Zasche and T. Fischer. The association, founded in 1861 and first based in Panská Street, was a mutual insurance company of 235 sugar-making factories (as of 1898) in the territory of Austria-Hungary. The insured property in the same year amounted to 526 million guldens. The first building on the left is No. 978, as from 1878 the headquarters of the mutual insurance bank Slávia, founded in 1869. The bank had the building reconstructed in 1901. The Art Nouveau front was designed by B. Bendelmayer. Slávia offered life insurance, as well as fire and hail insurance. It had branches all over Austria-Hungary, and its boom culminated in the years between the two world wars. The second building on the left is No. 977. Both buildings, which underwent several reconstructions, are still extant. The exchange was founded and launched in 1894 in order to advance commercial activities concerning agricultural commodities. Membership of the exchange was open to everyone who produced or traded in these commodities, and who had an Exchange card which cost 25 guldens per year. The main Exchange days occurred twice a week. The Neo-Renaissance building was constructed by the Jechenthal Hněvkovský CO. At a cost of 400 thousand guldens (including equipment) following a competition in which B. Ohmann probably participated. However, the result was arrived at by combining several competition proposals. 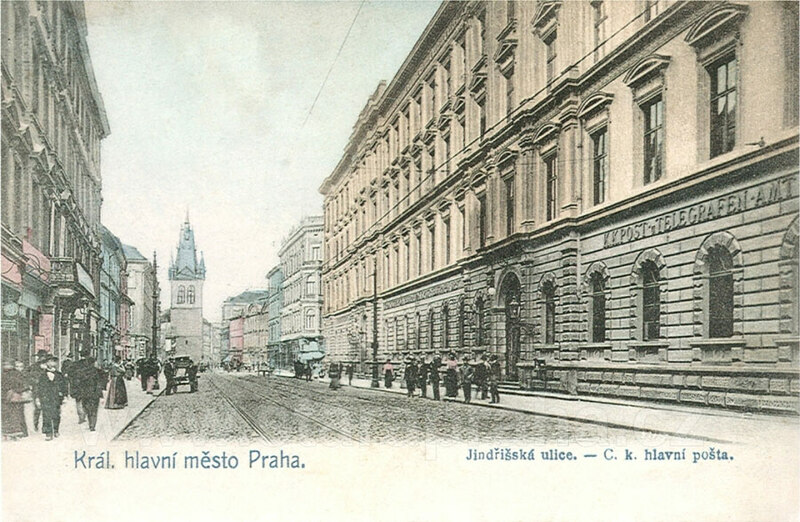 The building housed a café and the Czech Commercial Museum founded in 1896 with displayed samples of imported goods. The building U Strnisků, No. 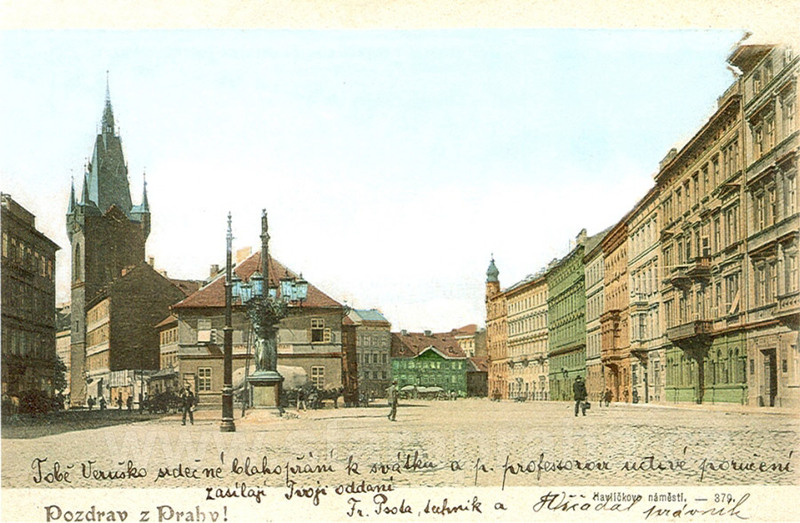 995, on the corner of Senovážná Square (on the right), lost its tower during the later elevation of the structure by one storey. Built on the occasion of the 60th anniversary of the Emperor’s rule. It was constructed in the years 1906-1908 in the Moorish style and designed by V. Stiassný and A. Richter for a numerous Jewish community in the New Town. Above the main entrance is a metal tablet with the relief inscription Have we not all one Father? Were we not created by one God? On the site of the Synagogue originally stood a building of the Israeli Association for Synagogues in Prague. 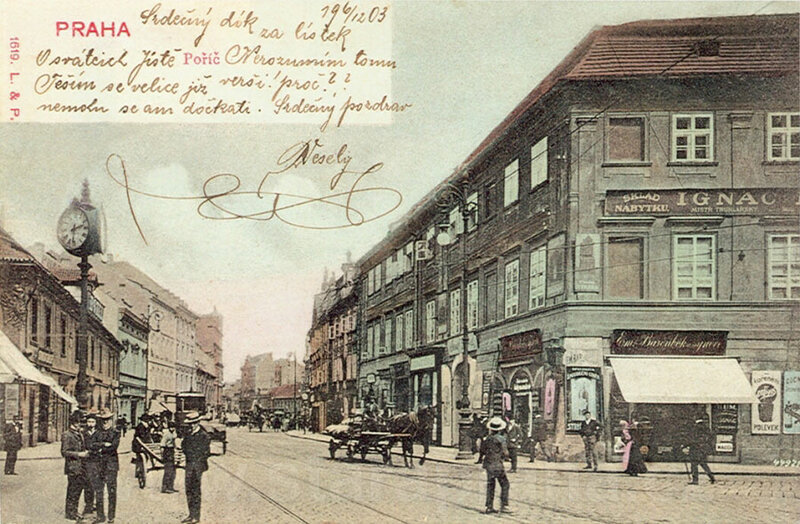 The reproduced postcard is a proof that pictures of buildings sometimes appeared on postcards even prior to the completion of their construction. While the front is finished, the main entrance is still surrounded by wooden crates and by boards with information on the development. The postcard was mailed on November 8, 1907. By that time, however, most of the interiors had been completed, as attested to by another well-known postcard published in the same year. Following demolition of the city ramparts which ran through here, the City Park was created (on the left is a part of the Park), and in the 1880s a row of buildings was constructed on the right. At the furthest left, in front of building No. 987, stood the New or Viennese Gate which marked the beginning of the road to Vienna. The Mortgage Bank in the middle of the picture stands on Senovážné Square, behind intersection of Mariánská and Bolzanova Streets. It was built in the years 1889-1890 in Neo-Renaissance style and designed by A. Wolf. The previous structure on the site was a military barracks, not illogically close to the gate and the fortification. The revolutionary year 1848 saw here an enraged mob trying to get inside to acquire weapons. The barracks were demolished simultaneously with the fortification in the years 1874-1875. Behind the Bank there is still a military bakery and a supply storehouse. Both were replaced in 1902 by Art Nouveau residential buildings. The three-storey corner building preceding the Bank was replaced in 1908 by the building of the Prague Ironmongers’ Company, designed by J. Zasche. The tower of the belfry was built in the years 1472-1476, reconstructed several times, and remodelled in Gothic style by J. Mocker in 1879. 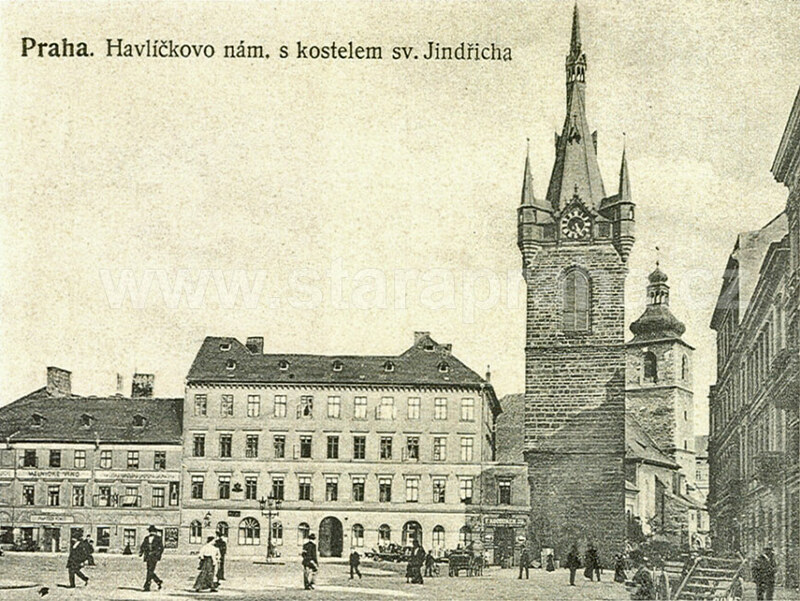 The tower stands directly at the axis of the street, and therefore Jindřišská continues past the belfry on the right, substantially narrowed. The site of the two buildings on the left with Neo-Classical facades had originally been covered by older buildings. The first of the two Neo-Classical buildings, No. 1308, on the corner of Panská Street, was rebuilt in 1924 and elevated according to plans by J. Gočár. The other building, No. 889, was replaced in 1925 by a bank building designed by P. Janák. In the middle of the block on the right stands the Harrach Palace, No. 939, with a late Rococo facade built in the years 1765-1770. 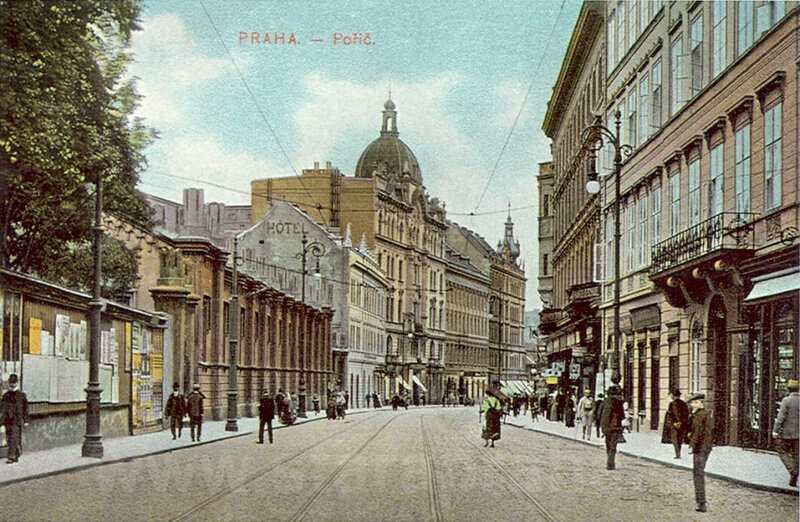 From 1883 the street was connected to the horse-drawn tram route operating between the New Town and Smíchov. 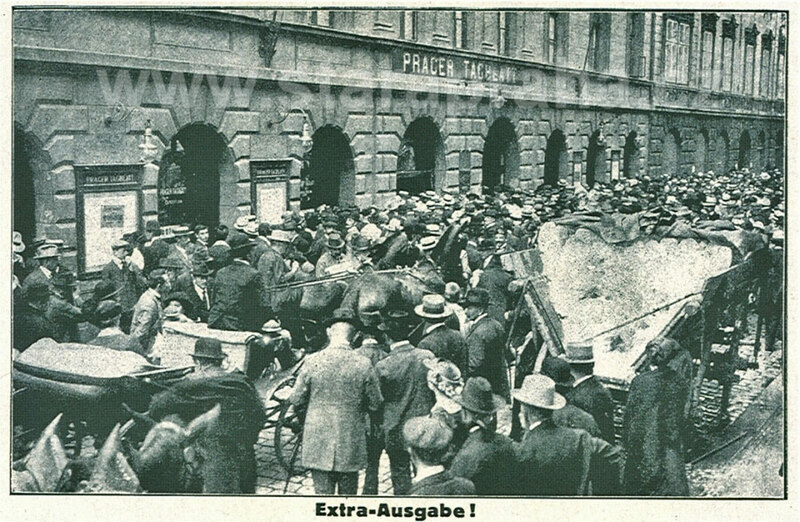 The large crowd waiting for news in front of the offices of the Prager Tagblatt newspaper in Panská Street, new No. 1480, built in 1906 and designed by E. Králíček. The picture was apparently taken shortly after assassination of the successor to the throne, Franz Ferdinand d’Este, in Sarajevo, when events were changing dramatically from one hour to the next. The leading newspapers reacted to the situation with several special editions each day. The men were obviously eager to find whether things would develop in the direction of war, or whether the situation could be solved diplomatically (the protracted exchange of telegrams between the Russian Czar and the German Emperor, exhorting one another to restraint). A fiacre is trying to make its way through the crowd, while a cart supplying the restaurants and residential buildings with ice on this hot July day is standing close to the pavement. The buildings in the street include several palaces of noblemen - hence probably the name of the street (Panská Street meaning the Street of the Nobility). This site was, in the 14th century, covered by a house with a large botanical garden owned by the Florence-born pharmacist Angelo. After 1736 the structure was replaced by a Celestine Convent with a church, which after its abolition was converted into a tobacco factory. 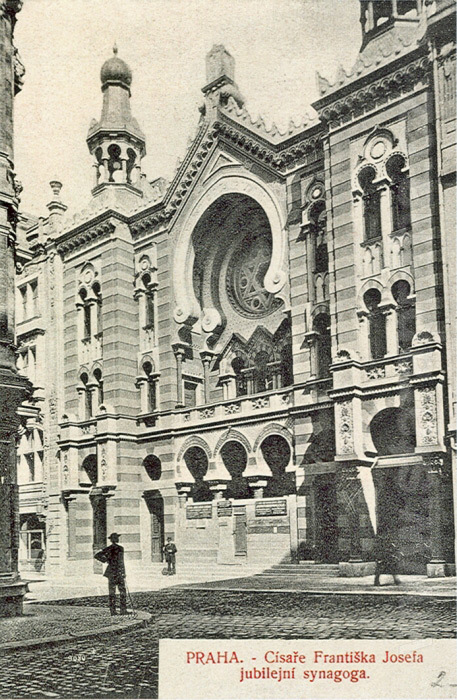 The facade of the Post Office Building, constructed in the years 1871-1874, was towards the end of the 19th century remodelled in Neo-Renaissance style. The year 1901 saw the addition of the famous hall which was created by the glassing-in of the courtyard and the allegorical paintings of postal and transportation activities by K. V. Mašek. 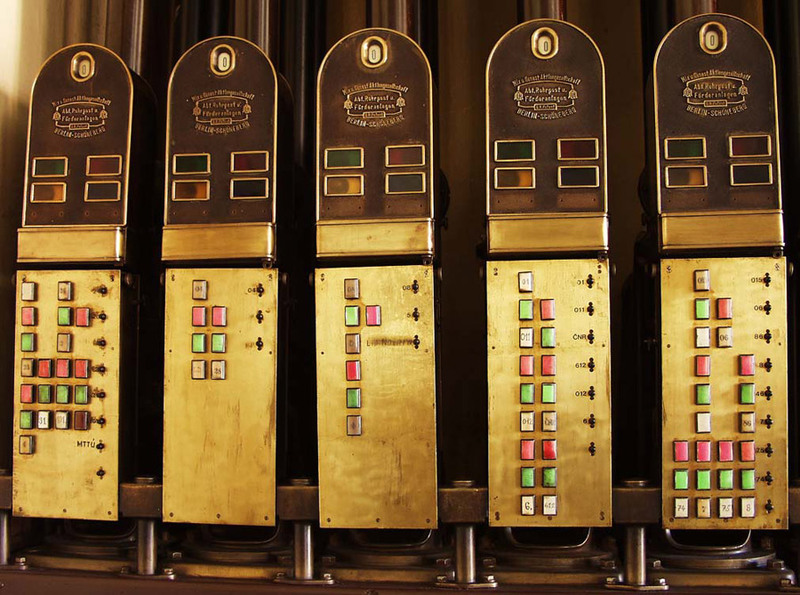 The building had from 1899 a pneumatic dispatch system which is still functional. 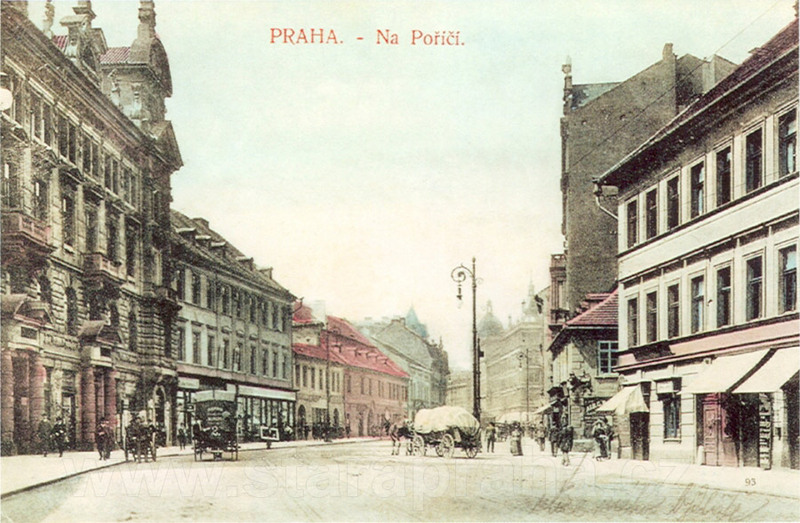 Opposite the Post Office stands the bulky structure U Tří placů (The Three Little Squares), No. 900. 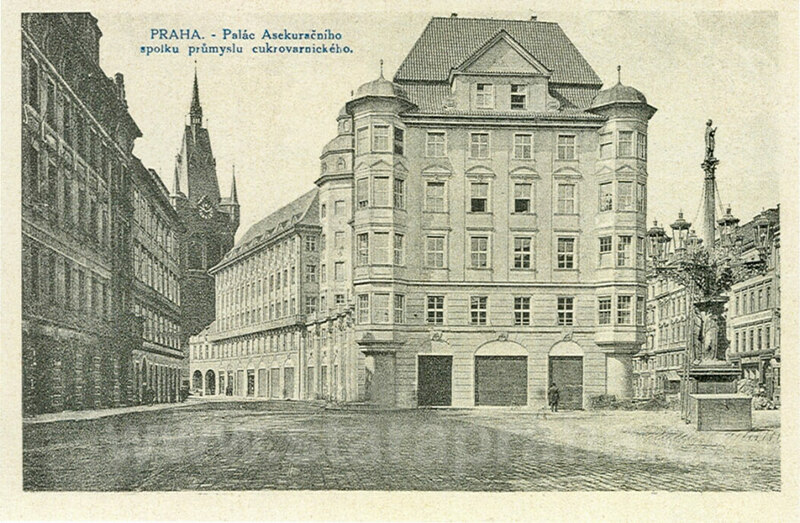 Around the year 1900 it housed the (Czech) National Printing Office, as well as the offices of the Czech periodicals Hlas národa (The Voice of the Nation) and Pražský ilustrovaný kurýr (The Prague Illustrated Courier), and also the German Realgymnasium (i.e. science-oriented grammar school). 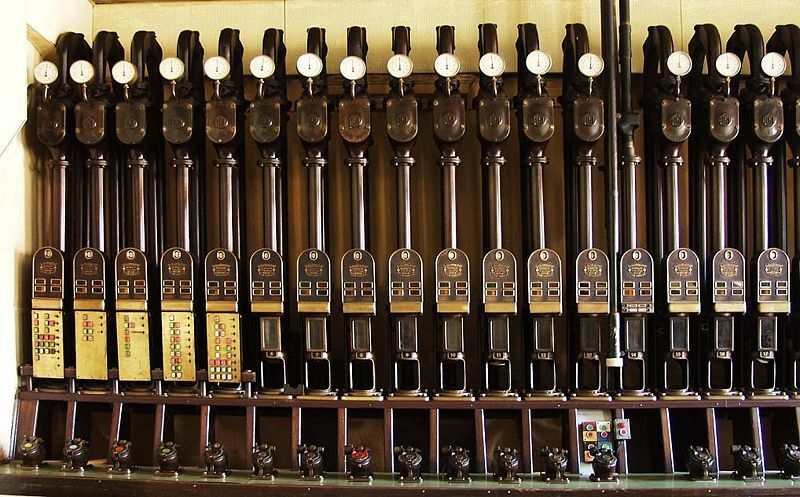 The Prague pneumatic post (Czech: Pražská potrubní pošta) is the world's last preserved municipal pneumatic post system. It is an underground system of metal tubes under the wider centre of Prague, totalling about 55 kilometres (34 mi) in length. Known as the Old Lady of Czech telecommunications, the system started service in 1889 and remained in use by the government, banks and the media until it was rendered inoperative by the August 2002 European floods. The current owner, Telefónica O2 Czech Republic gradually is repairing and conserving the system; due to limited funding the system remained inoperative as of March 2007. Each lane is equipped with a dedicated propulsion unit, consisting of an electrically-powered air pump. One pump can service at most 3 kilometers of pipeline, so it's necessary to use several pumps on longer lanes. The pumps must be reversible, creating either pressure or vacuum. The pumps are connected to the pipes with tee-fittings. On both sides of the tee the pipe is equipped with switches activated by a passing capsule. At first the pump is set to intake mode, pulling the capsule towards the tee. Before reaching it, the capsule hits the first switch, causing the pump to start reversing. Meanwhile the capsule reaches the tee-fitting. As it passes the tee, the pump is already fully reversed and starts to push the capsule away. The older pumps were bladed, having a single blade, mounted eccentrically inside a 300 mm high cylinder. 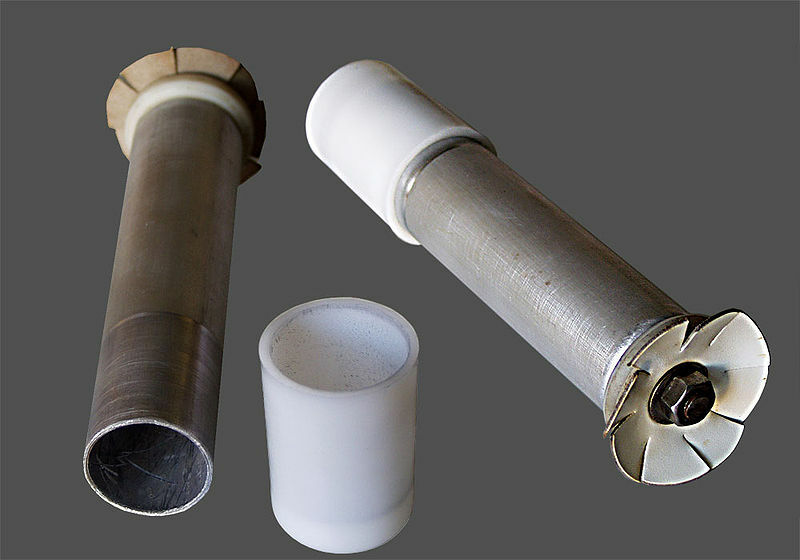 More recent pumps employ a rotating piston instead. This originally two-storey building was remodelled in Neo-Classical style in 1837-1838 and, in 1845, in connection with the construction of the railway station, elevated to three storeys. At the same time the whole second storey was converted into the luxurious Café U nádraží (At the Railway Station). The Café was built and furnished at a cost of 40 thousand guldens in Moorish style, with beautiful stucco interiors and ceilings decorated with paintings. The ceiling was supported by 12 cast-iron columns on whose bearing stones were painted scenes from the thousand and One Nights. The complete impression was further underlined by mirrors between the windows, stylish furniture by eybler, two pools with a fountain, and gold-embellished wall coverings. The café complex also included a billiards saloon, a reading room and a gambling club. This café and its unique con ception, whose authors were the owners, Š. and J. Heichen walders, launched a new era in the history of Prague cafés. In 1875 the Café was abolished so that all the above-ground storeys could be used as a hotel, while the ground floor was used as a restaurant with a tap-room. Probably in the 1920s the structure was elevated by another storey, and in 1958 an arcade was added to it. As seen from the intersection with Na Florenci and U Ratejny Streets. 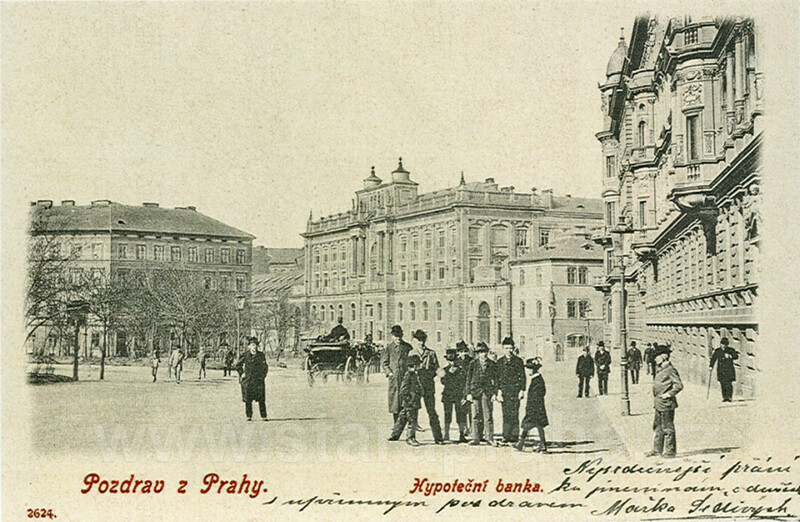 This picture from the early 1920s documents the same type of street image as the previous picture, with the exception of the new building of the banking house Legiobanka in the background. The next building on the left is still extant and currently under reconstruction. The third structure, U Dědků, new No. 1053, with a bay, known also as Vysoký (The Tall One), is one of the first five-storey structures built in the street in the 1890s. At the time of the picture it served as the seat of a branch of the American Bank. The original time-honoured building U Dědků housed from the 18th century the most exquisite Prague dancing hall which was used for balls till the first decades of the 19th century. 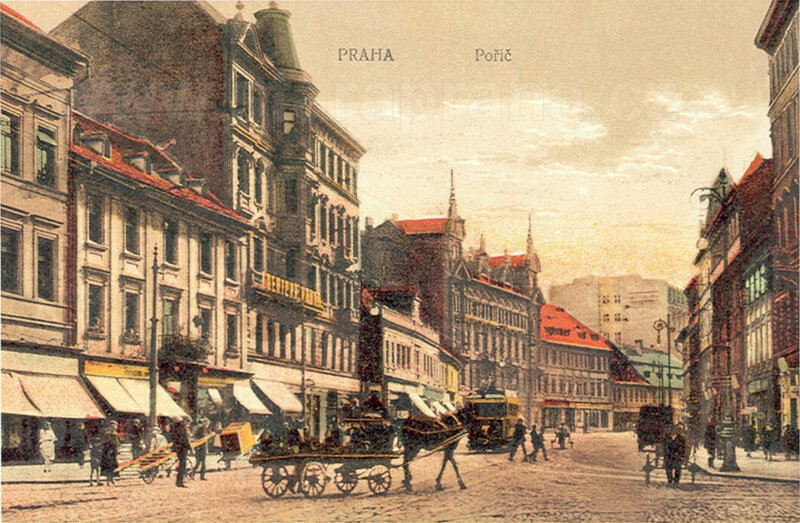 Later the hall and the restaurant declined and began to serve as a refuge for Prague’s poor. The Bondy Building (with the two spires) was essentially reconstructed in the 1930s: the statues and gables were removed, and the building elevated by three storeys. A picture taken from the intersection of Poříčská Street (with the tram) with Zlatnická Street (on the left) and Jezdecká Street (on the right). 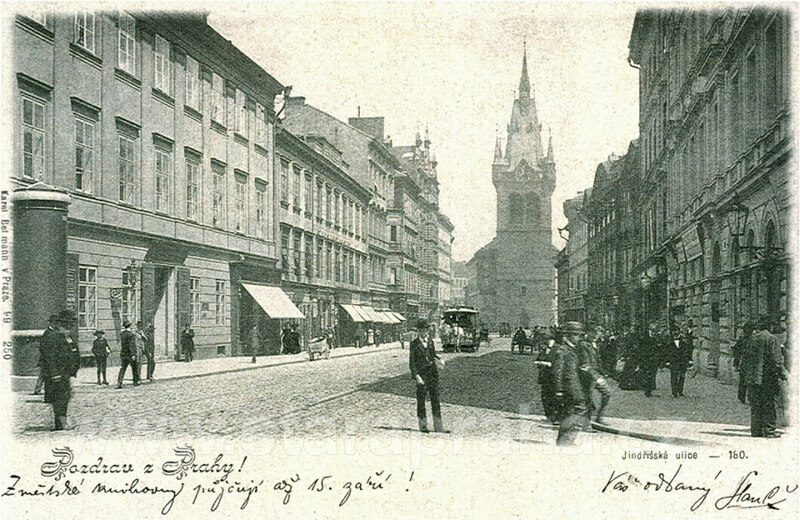 The photograph shows the elongated arch of the eastern section of Poříčská Street, as well as the busyness of the street. In this section the older buildings are still predominant. On the right, on the corner of Jezdecká Street, we can see a bulky building No. 1044, constructed at the end of the 18th century. This structure replaced two mediaeval houses which had burnt down. The building has a large courtyard used by a company producing and storing furniture, as the large corner advertisement announces to the passers-by. All the shop windows, including the gate-leafs and spaces for advertising, are truly antique, probably as old as the structure itself. The carefully reconstructed building is still extant. The following building, No. 1045, still awaits its reconstruction today. On the left, on the corner of Zlatnická Street, stands building No. 1072 with a long front facing Poříčská Street (see picture 510). It was on its site that the Hotel Imperial was built in the years 1913-1916 whose remarkable interiors are decorated with ceramic tiles with Assyrian and Babylonian motifs. As seen from its approximate centre, from the pub U Bílé labutě (The White Swan), looking towards the west to Josefské Square. On the right we can see building No. 1068 which housed the famous restaurant and cabaret U Bílé labutě. Following demolition of the building, the company Brouk & Babka built here in 1938-1939 the popular department store Bílá labuť (The White Swan). The ground floor was connected with the second storey via the first ever escalator in Prague, for a long time the only one. The last low-rise structure in the row on the corner of Zlatnická Street, called Černý orel (The Black Eagle), No. 1072, once housed a brewery. On the left we can see a part of building No. 1047 - the old U Rozvařilů brewery, later, till the 1930s, a popular Prague cabaret. 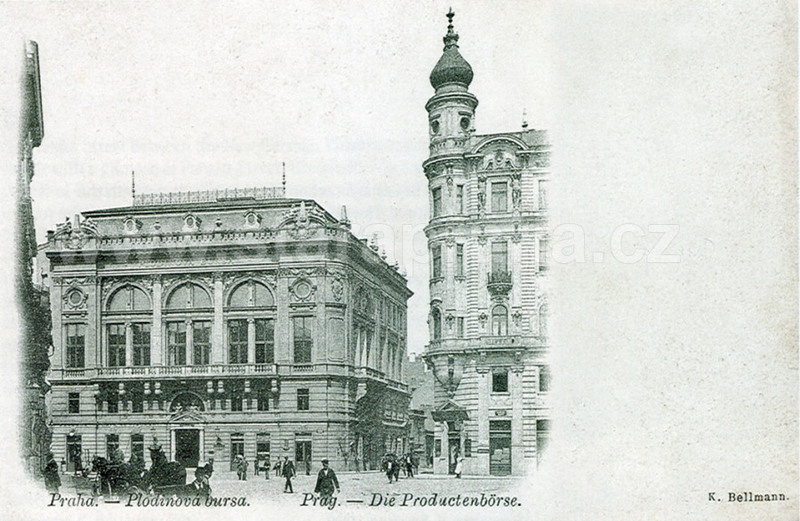 It was replaced by a modern building whose basement housed the well-known E. F. Burian theatre (today the Archa theatre). The carefully reconstructed structure serves today as the headquarters of the Czech Commercial Bank. The following building, U Bucků, No. 1046, used to house another brewery with a popular pub, and from 1869 also the First Czech tingl-tangl (i.e. music hall). In 1921-1923 it was replaced by the building of the banking house Legiobanka. The pedestrians in the foreground cross Na Florenci Street (on the left) which ended here. On the other side (on the right, just off the picture) the communication line continues towards Těšnov and the Helmovské Mills at the Vltava River through U Ratejny Street. This line is identical with the Baroque fortification which stood here until 1874 and which allowed for little space between itself and the opposite row of buildings. On the right, in the fortification (off the picture), used to stand the Poříčská Gate. On the left we can see the Neo-Classical corner building U Dundrlů, No. 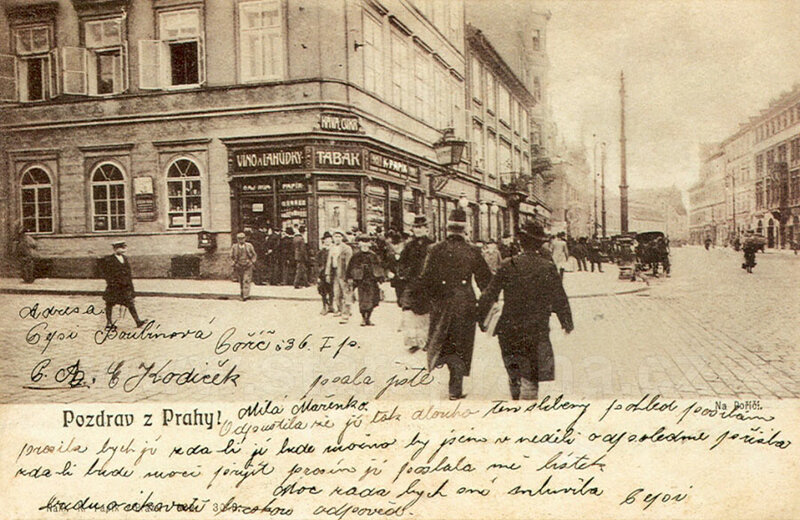 1055, with K. Papík’s general store, general meaning rather universal, as it sold such incongruous items as delicatessen goods, wine, rum, tea, coffee, tobacco, paper and all kinds of postcards. In the 1920s the building was replaced by a five-storey modern building. The following three-storey building U Člověků (The Human Beings) is currently under reconstruction. On the left we can see the wall of the monastery garden, behind it is the riding school of the Josefské Barracks, further the three-storey hotel building U Císaře rakouského (The Emperor of Austria), No. 1076, built on the site of three mediaeval houses. The five-storey building with a cupola, standing on the site of two mediaeval houses, was called Bílá bota (The White Shoe), new No. 1075, housing the Workers’ Accident Insurance Company of the Bohemian Kingdom, and the R. Ryšavý bookshop on the ground floor. The following building is Anglický dvůr (The English Court), formerly called U Zeleného vola (The Green Ox), and on the corner of Zlatnická Street we can see the structure with a little tower U Jelena (The Deer), new No. 1073. 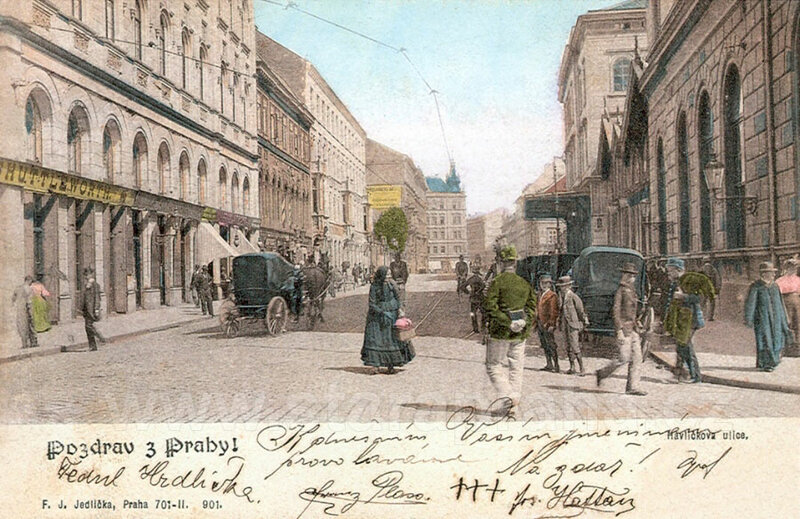 On the right is the Neo-Classical building U Klebelsbergů with a balcony, No. 1035, once a post office. On the side wall of this building (see picture 513), nowadays replaced by a modern structure, appeared in the 1920s and 1930s weekly advertisements for film premiéres painted by the renowned Czech graphic artist and painter F. Tichý, a true attraction for the passers-by. 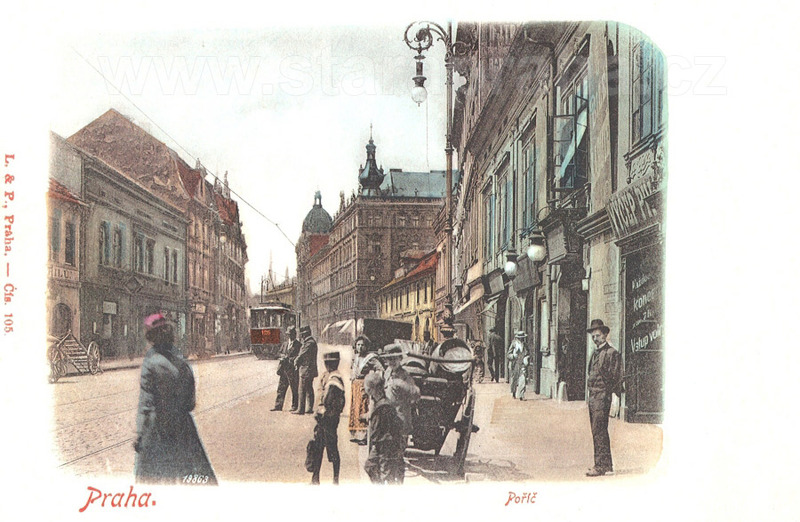 This was the first route of Prague’s horse-drawn tram (1875), connecting the quarter of Karlín through Poříčská Street, Josefské Square, Na Příkopě and Ferdinandova Streets with the National Theatre (the terminus was at the chain bridge). At the time of this picture the trams were already electrified. The busy metropolitan life, with higher buildings in what is practically a part of the broader city centre, contrasts with the old structure which is reminiscent of a village house. Prior to its demolition its front was for some time used as a cheap poster space. That continued even on the wall with the portal, and ended on the side wall of the building with the refreshment stall (No. 1035 - see picture 285). The building had a passage through which one could pass, as one could through the gate in the wall, across the courtyard with a row of trees to Hybernská Street. A view from na Florenci Street looking east at the Prague City Museum and at Palackého Street leading to the Karlín Quarter. The first building in the museum complex was the structure with the domed roof, a former café pavilion in the Na Poříčí Park, No. 1554. 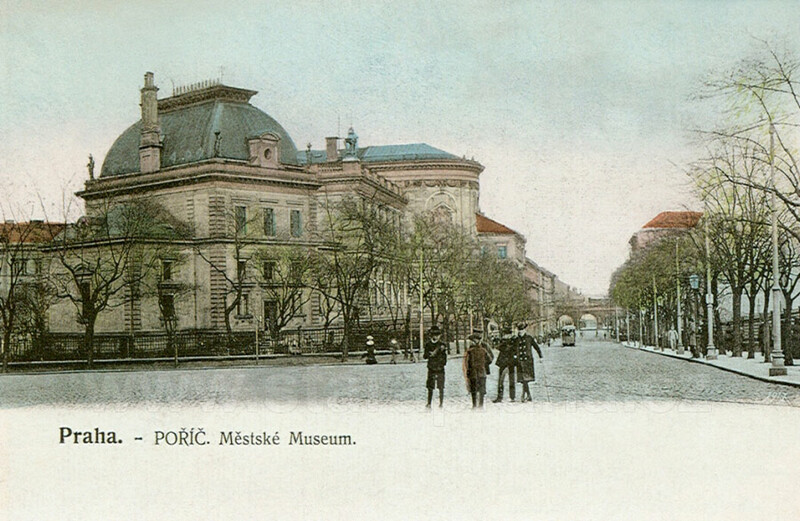 From 1883 it housed the museum collections of the Prague City Museum. In the period 1896-1898 another museum building, constructed in Neo-Renaissance style, was added to the former structure. The structure was designed by the noted architects A. Balšánek and A. Wiehl. From the building we can see its rear wing with an apse in the middle. The former pavilion served at this time as a depository of the Museum. This structure was demolished in the 1970s in connection with construction of the North-South City Arterial Road. 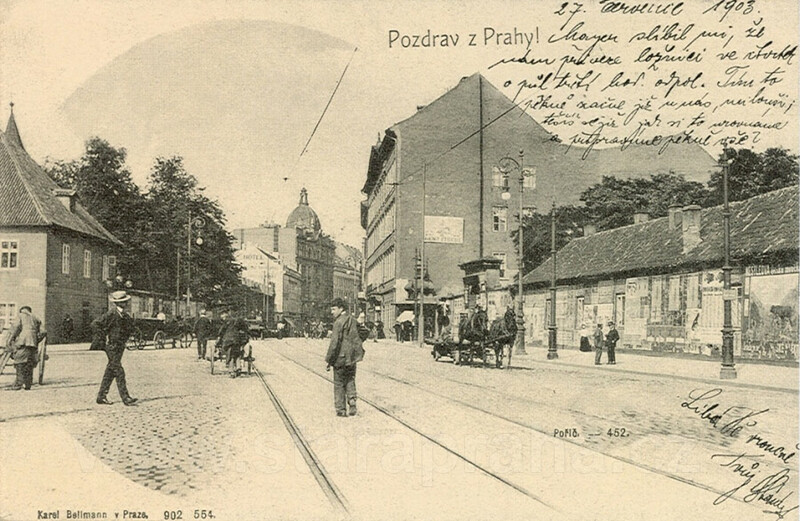 The horse-drawn tram turned at this point to the right, to the nearby railway station, and continued through Jezdecká to Poříčská Street. In the background we can see two arches of the Negrelli viaduct.